DAVID: If I were to buy and plant a PawPaw in my yard, would it need a second one for pollination? TERRI: They are not self-pollinating so you need two plants to have fruit. It is not jthat they have only male or female flowers - God made them perfect in that they have both male and female parts of the flower. But, just like middle school, the female part has matured and moved on before the male part has matured. They do cross pollinate easily between species, resulting in some really pretty flowers. DAVID: Do we need to hang rotting chicken necks around the trees to get fruit? My wife really doesn't like that idea! 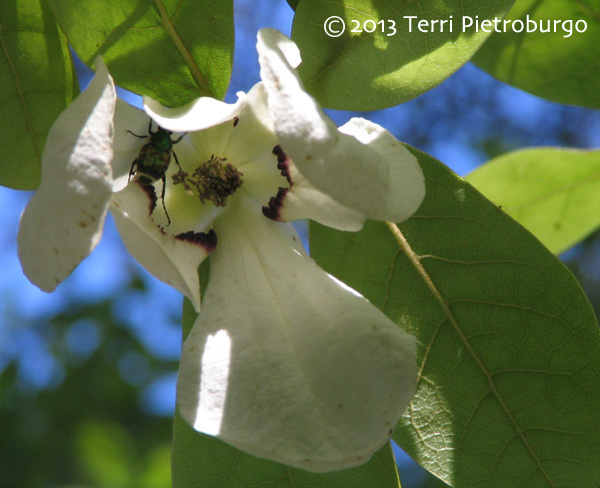 TERRI: Pawpaws are pollinated by beetles and flies not bees. Some growers up north hang dead chickens or roadkill in their groves to attract the pollinators. This is not at all necessary for the homeowner to do. I get plenty of fruit off the ones in my yard and not a dead chicken in sight. If you plant it the pollinators will come. DAVID: Excellent. There’s one less objection… but aren't PawPaws a pain in the neck to grow? Why should we bother? TERRI: Pawpaws are easy to grow if you are given good growing instructions - and follow them - and don't treat them like your other plants. There are so many reasons to plant a pawpaw in your yard. They are the only plant the caterpillars of the beautiful zebra swallowtail butterfly will eat. 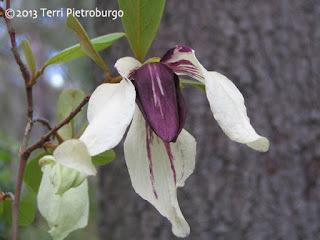 They have very beautiful flowers and are very hardy after they are established. The edible fruit feeds us and the wildlife. They are drought tolerant, cold tolerant and very long lived. Make sure you buy a pawpaw that has been grown correctly from the start as it makes a big difference on whether it survives and thrives or not. DAVID: That makes sense. Now, being a total plant nerd, I really want to grow some. Where should I plant them and what do I need to do to keep them alive? 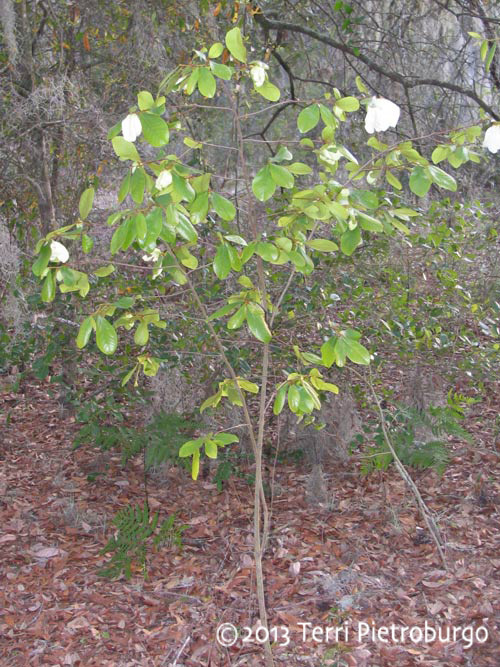 TERRI: Seven of our Florida pawpaw species will take shade to full sun after the first year they are planted out. They must be shaded for the first year as they are very sensitive to the sun until they are established. After that they bloom better in full sun but will bloom and produce fruit in the shade as well. It is important not to let the root system dry out completely until established but they also don't like wet feet either. I use a tomato cage with some shade cloth on it for the first year. These species like well drained and not very fertile soils... like most of our Florida soils. 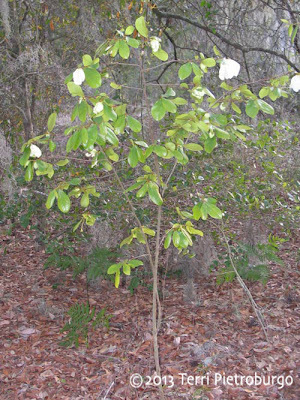 The eighth species, which is the Asimina parviflora or "Smallflower Pawpaw," is an tall understory shrub to small tree. 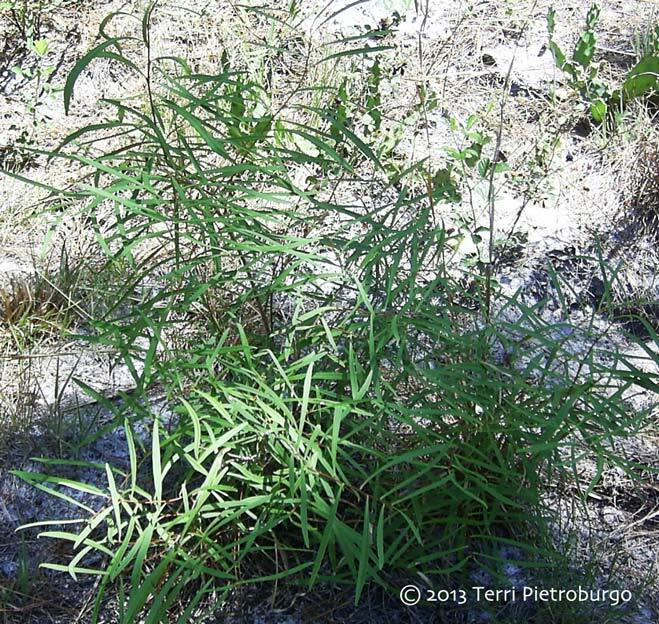 It likes the shade and its growth habit is effected by how heavy the shade it gets. In dappled shade it will be a shrub and in heavy shade it's more of a small tree. It fruits fine in the shade. It also likes moist, fertile but well-drained soil. DAVID: From what I've seen, you seem to be pretty much the only person in the state raising our native PawPaws for sale. Where can we find your price list and ordering info? My plants are $15 for all species. I do ship and sell retail and wholesale. DAVID: Very cool. Thanks a bunch for answering my questions. See you March 9th! 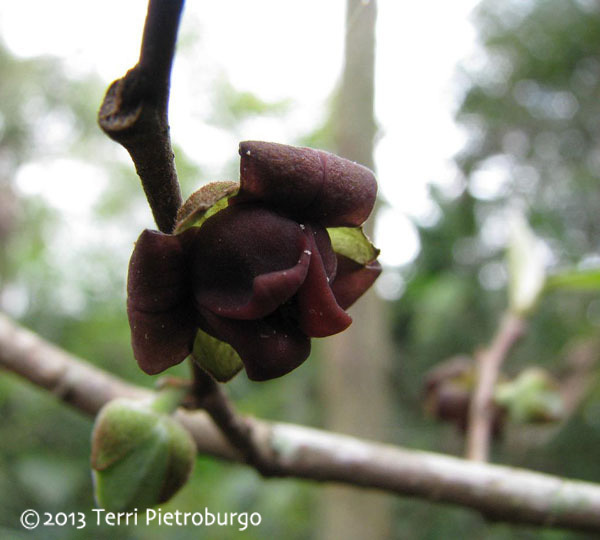 Asimina angustifolia (the Slimleaf Pawpaw) in the wild. sweet, i'll check her out when she comes to tampa, no doubt for the USF Botanical Gardens sale. and i'll let her know there is at least one other plant the zebra butterfly enjoys - my invasive passionflowers! Actually... she's talking about the Zebra Swallowtail, not the Zebra Longwing. so... i was talking with the extension agent... and long story short we both agree $15 for the trees is a lot when the fruit is sub-par. loquats are an all-around better choice. he was also telling me there was some new-ish bugs eating the persimmons around here. dont remember if he dropped the name. something to look out for. You're not just talking fruit trees, though - you're talking about rare natives. People pay more than that for their silverthorn bushes. I agree that we are not making a like comparison when we compare a native paw paw to a loquat. I planted it because it is a native and because of the Swallowtail. I also paid $20 at the Ocala show 2 years ago....her prices have come down 25%....a bargain! Yes. And you know what? 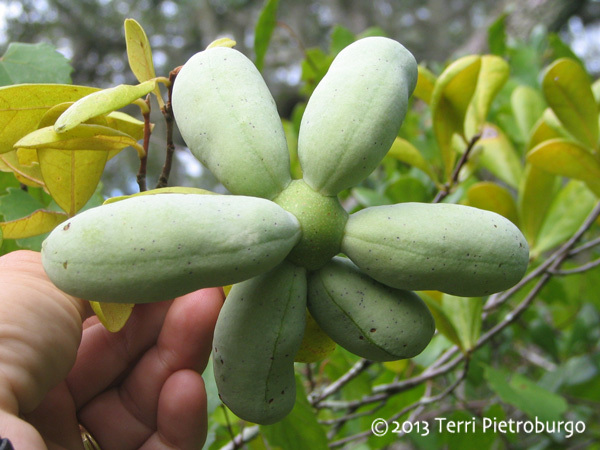 With some breeding, it may be possible to find and improve native pawpaw varieties. I don't believe any work at all has been done in that regard. I understd you need at least two plants to pollinate, but do you need different species to cross pollinate? I plan on planting six pawpaws of the same species, unless you tell me otherwise! The same species is fine. Anyone know if Pietro's Pawpaws is still in business? I'm looking to get ahold of some and have had trouble getting a response. Thanks! I believe she's on hiatus at the moment - still growing some, though, because a friend of mine at the Kanapaha show was selling some of her pawpaws there. In my nursery I currently have some A. parviflora growing and a few A. Trilobas that should be ready in a month or two. Yes. Some are almost inedible... A. pygmaea, for instance, tastes to me like rotten avocado. Compost is NOT enough? Steve!? NOOOOO!! !